Located on the west coast of Koh Chang, in the town of Klong Prao (map) next to the Tourist Police Office and the Temple (Wat Klong Prao). We provide high-speed internet access in a comfortable relaxed atmosphere with a helpful friendly service. i-site Koh Chang is the ideal place for travellers, holiday makers and locals who want to catch up with the news from home, e-mail a friend, update your blog or write about your travels on face book. We also provide overseas calls and tour booking & information for many of Koh Chang's activities. If you're staying Koh Chang why not come and visit us. we also provide Information and advice about where to go and what to do for travellers and holiday makers visiting the island. 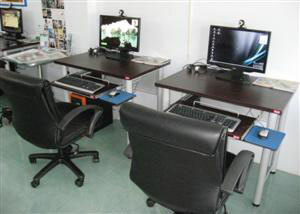 i-site Koh Chang Internet Cafe is set in comfortable, air-conditioned surroundings. All of our computers are spaced proportionately using modern workstations and have comfortable high backed swivel chairs. Only 1 baht per minute! All computers are modern, up-to-date and use 19" wide screen monitors and have the latest Internet Browsers, Office Suite, Messengers and Virus Software installed. Our internet link is a wired 4 mb/sec ADSL connection and offers excellent call quality, fast upload of photos to the internet and amazing web surfing experience. All Computers are connected to a centralised Printer and a scanning facility is also available..
Skype is also installed on all of our computers. If you have your own laptop you can connect to the internet via Wi-Fi or direct cable connection. Like our normal internet connection getting on line with your laptop will cost only 1 baht per minute. If you have caught a virus on your memory stick we will remove it for free!!! We also offer a computer repair service for those of you who have slow, unresponsive or virus infected computers. Our repair service is based on a no fix no fee basis. In addition to offering the best internet service on Koh Chang we also offer a number of other services for our customers.